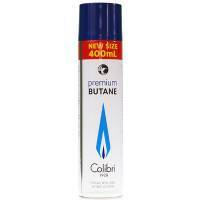 Colibri Butane is one the cleanest butanes available on the market. This butane is produced to the exacting standards required by high performance jet-flame lighters as well as BHO extraction. Colibrì butane is processed in world-class refineries and canned in only the cleanest environment possible, resulting in fuel so pure -less than 6 parts per million!- that it does not require repeated filterings to remove the unwanted matter and contaminants that affect the performance of your lighters, and adulterate the flavor of your premium cigar and/or tobacco. Its level of purity allows us to recommend this butane for all refillable butane lighters and for BHO extraction. Buy this economy pack and save: 12x400ml bottles in one delivery. Aerosol cans must be stored in a well-ventilated place. Keep the can upright with the valve facing down for 5 seconds and press the lighter against the cylinder valve. Leave the gas in the lighter for 1 minute before use. Before starting any kind of extraction you must ensure you own and others safety, always working consciously. Butane Honey Oil (BHO) extraction is an extremely dangerous activity. Butane is flammable, explosive and can potentially contain poisonous and harmful chemicals. Undertaking BHO extraction may result in serious bodily injury, or Death if proper precautions are not taken. Butane is Highly Flammable and ALL extractions are to be done Outdoors Only, doing extractions indoors is extremely dangerous. making sure to be away from any source of electricity or any flame, burner and so on. Butane gas is heavier than air and will pool in low areas, if left to collect butane gas becomes flammable when it reaches 1.8% to 8.5% concentration in air. A small breeze will keep the butane from being able to pool and become dangerous. It is recommended you take every precaution possible. You must wear safety clothing such as the eye protection and mouth mask together with gloves at all times and always have a fire extinguisher ready to be used: protect eyes, hands and mouth during the extraction. Strictly avoid the use of Bhutan Gas from unknown sources or producers: the risk of intoxication is very high: materials such as PVC, gum plastics and metals at oxidation risks must be avoided as could suffer from thermic stress: only use borosilicate (Pyrex) and Stainless Steel 18/10. Butane gas is highly flammable and explosive; please ensure you have taken all and every safety measure.